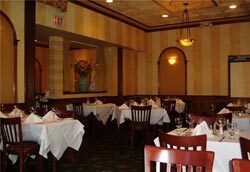 A New Jersey restaurant review of a popular Italian restaurant in Ridgewood, NJ. This Ridgewood, NJ BYOB Italian restaurant is below the standards of other Ridgewood area restaurants and the quality of food and service has had a drop-off in recent years. The food is traditional Italian and the preparation while good, doesn't standout above other area Italian restaurants. The selections lack imagination, and the menu continues to remain the same. The popular starters are: the Fried Calamari with marinara sauce; Grilled Eggplant filled with spinach and ricotta cheese with tomato sauce and basil; and the Baby Mussels in a marinara or oil and garlic sauce. The popular dinner entrees are: the Chicken Breast with arugula, sun-dried tomato, radicchio and olives in a balsamic vinegar demi glace; The Breaded Veal Medallions topped with an arugula, tomato and red onion salad; and the Shrimp sauteed with white wine, garlic, oil and lemon served over linguine. While reservations are accepted at Marra's, they tend to overbook so be prepared for a wait. Service is friendly but can be rushed during the busy weekend times.